This was my little teaser consisting of flameless tea lights, my new Martha Stewart score board and my copy of the Technique Junkies Fancy Folds and Motion Paper Crafts CD. Then I found that my mojo would not cooperate. Until yesterday, that is! Ta Da! Here you have it; a Votive Card from my favorite crafting CD. Serenity Prayer stamp by Inkadinkado, small shells by Rubber Stamp Tapestry, larger shells from The Stampin' Place, vintage seaside images from the By the Sea Plate by Oxford Impressions. This card was made for someone who celebrated a huge milestone yesterday, but back in December, from the moment I saw this tutorial, I knew I also wanted to make them for all the mothers at the family get-together on Mother's Day. I was, however, less than thrilled with the idea of mixing flame with paper and ink, and was very happy when I found these flameless tea lights at my local Target, $10 for a dozen, each with a 72-hour battery life. This was not as easy as some of the other fancy folds on the CD, and one of these days I will definitely invest in a 1 3/8" square punch so that I don't have to cut all of the openings by hand, but I love the result, and I have so many ideas for these that I can't wait to get back in my craft room and get them started. In exam news, I decided I needed more time so I rescheduled for May 24th. Until then, I will be studying like crazy, but taking the occasional crafting break. I'm really loving easel cards lately. The size of the main panel is the same A2 size that I'm used to working with, but presented in an impressive way that is easy to put together. Here is the newest one which I've already sent out to Donald's cousins. As I said in my last post, I struggled a bit with the darkness of the background in the photo, but I found that when I used the black and white designer paper (that was still out on my worktable from my mother's birthday card) as a matte and then surrounded it with this delicious vintage wallpaper from Donna Layton, it wasn't an issue. The fact that the vintage ribbon matches the decoration on the egg in the photo was just another piece of luck and I'm really happy with this card. Exam or no exam, Easter Sunday is only a week away, so I had to get a couple of cards done yesterday. Here is the first which is for Don's parents. I struggled a little with this one. I had printed the image over a month ago when I was printing out some other vintage images for St. Patrick's Day, in the meantime, whenever I thought about the Easter cards, I had trouble getting past the dark tint for a holiday usually associated with cheery colors. I'm not in love with this one, but I'm happy with it and I love the way the crystal embellishments (more beauties from Donna Layton) mirror the color and shape of the egg in the photo. I'm not going to show my second card in this post. This card will pale by comparison. So I'll be back in the next couple of days with that one. Two weeks from today I will be taking a certification exam. I had planned that I would not be participating in any linky parties until then, but when I saw this week's prompt for Sepia Saturday, I could not resist! In 1938 my paternal grandfather, Howard Matthews, was Executive Secretary of the Oriental Institute at the University of Chicago. Back then, the Institute had four expeditions operating in what was then known as the Near East; the Epigraphic Expedition in Luxor, Egypt, where they were copying the inscriptions of the walls on the temples in that area; the Megiddo Expedition in Palestine which was excavating the site of Armageddon; the Persian (now Iran, of course) which was excavating the Temple of Darius and Xerxes at Persepolis; and the Syrian Expedition at Allepo, near Antioch. In 1938 Grandpa was sent to do the rounds of these expeditions and my grandmother, Dagmar, went with him, leaving New York at the end of February and returning on the Aquitania on June 1. I wish I could say that I have pictures of my grandparents riding camels, but I do have these. Grandpa's caption reads"Guide who sang "Yes, we have no Bananas"
---on our way to Sakkarah." I had heard of this trip my entire life. My grandparents always had their Howard Carter prints and other mementos in their home in Connecticut, but I had never seen this album until after my father's death six years ago. I certainly had never imagined that I would see a photo of my grandmother with her skirt hiked up to her thigh so that she could ride a donkey! If you knew her the way I did, you would share my surprise. There is also this excerpt from a letter home during their stay in Cairo, "Last night they got in touch with us about 10 pm, and asked if we wanted to see the pyramids by moonlight. We rushed up and changed our clothes. We girls all wore slacks so we could ride on a camel, but the camels had gone to bed, or so we thought, but after a while one lone dragoman and a camel came along, so we all had a ride. The camel's name was Missouri and he was a nice fellow. He jogged along and trotted and I bounced. When Missouri was to let me off I thought I'd fall because he first collapsed his front legs, then lowered his rear end slowly. Then we had our fortunes told, a lot of bosh but it was fun. We got back to our hotel at 1:30 am." What I wouldn't give to have some pictures of that outing! My grandmother on a camel AND in slacks. Both equally shocking to me, I never saw either in my life. This is as close as I'll get. Don't you just love the saddle shoes? These are such precious photos! I'm so glad that my father left them for me. He would have been 75 next week and I miss him as much as six years ago. Well, as I said, I really shouldn't be playing at all right now, so please don't be offended if I don't get to visit you for a few days or more. Be back with some Easter cards tomorrow or Sunday. Oh, the mojo thing really did me in this week! This is my mother's birthday card, finally. Her birthday was yesterday. Main image stamp by The Stamping Ground (no longer available), sentiment by DRS Designs and calendar by Purple Onion Designs. Moxie wanted in on the action while I was taking this picture. A closeup of the calendar. You can see that the easel is held open by this gorgeous vintage Swarovski crystal from Donna Layton's shop. I finished the card this afternoon. (Hangs head in shame.) Mum hasn't even seen it yet, but you get to see it first because this will be auto-posting as we sit down for dinner. This combination of papers was one of those happy accidents that happens when you are clearing away paper after multiple unrelated projects. It's been sitting on the corner of my worktable waiting for the right project. In other news, I finally scheduled my certification exam for the afternoon of April 29th, so I will be very busy studying until then. I've decided that I will not be posting for Vintage Thingie Thursday or Sepia Saturday again until after the exam. Crafting, however, should be a good break for me, so I will be popping in every now and again to show you what I've been up to. This Saturday is my mother's 74th birthday. On Thursday, I shared her beautiful baby book for Vintage Thingie Thursday and today I am going to share some baby and childhood pictures. With her paternal grandmother, "Granny" Smith. My grandmother, Marjorie Dean Smith with her sister Dorothy Dean Copeland and their two babies, my mother Janet and her cousin, Georgia. I love this picture of my mother with my Grandpa George. It was taken on the porch of the farmhouse in North Hatley, Quebec where my grandmother was born. When this picture was taken my great uncle, Kenneth Dean, was running the farm. Today it is still in the family, run by Kenneth's grandson, Neal, and his family. For anyone who thinks that photo Christmas cards are a modern invention. Love this one. One the back, in my grandmother's handwriting, "Janet off to Sunday school." This is one of my favorite family photos. This is my gradmother and mother and it was taken for my grandfather. It is wrinkled and torn and much loved as he carried it with him overseas during World War II. If you are reading this post before mid-week when I plan to change it to a spring photo, you can see another picture of my Mum in my header. 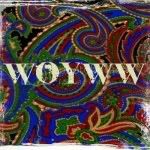 OK, don't forget to join the party here for photographic history. PS - As to the promised craft post; I tried, I really did. There was just no mojo. It was something of a disaster in there, it was ugly, but at least no one got hurt. I'm heading back in there after "Who Do You Think You Are?". Good, bad, or ugly, I'll show the results on Sunday. This Saturday will be my mother's birthday, so in her honor, I am sharing her absolutely gorgeous baby book. I love every thing about this book, the satin cover, the handpainting on the cover and the delicious illustrations. In case you're worried, I do have her permission to share her birth date. And here is the birthday girl in the hospital with my grandmother. That's also her in the picture up in my blog banner. For those of you looking for evidence of my crafty pursuits, I must admit that I spent my free time yesterday finishing my resume and I spent today networking at an association meeting. But tomorrow, I plan to do nothing (except walk the dog) until I have used those all three of the ingredients shown in my photo, to make something crafty. 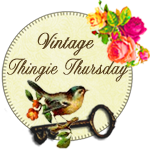 Until then, don't forget to check out all the lovely Vintage Thingies showcased over at Vintage Thingie Thursday.